An electrical circuit breaker panel is the main distribution point for electrical circuits in your home. It usually provides between 100 and 200 amps of power, depending on the rating of the panel. Power comes to your home from the utility company's lines (collectively called the service entrance). It flows through an electrical meter, which records your electricity usage, and then into the panel. Some systems also have a large disconnect switch between the meter and the panel. The service entrance wires connect to two large terminals, called lugs, near the top of the panel. These lugs are always energized unless the utility company shuts off the power. The lugs—and all the wiring connecting to the panel box—are covered by a flat metal panel called the dead front cover. This is what you see when you open the door of your breaker panel. The dead front cover has cutouts that allow access to all the breakers, and that's as far as homeowners need to go. Do not remove the dead front cover unless you know what you're doing. Most circuit breaker panels have two vertical rows of breakers. Above (or sometimes below) the rows is a large breaker called the main breaker. This breaker controls the power to all of the other breakers. If you switch off the main breaker, you turn off all the circuits in the house at once. However, this does not mean the panel is not energized. The lugs that connect to the service lines remain energized whether the main breaker is on or off. That's why you should never remove the dead front cover or go poking around inside a circuit breaker panel. The main breaker is marked with the value of protection (such as 100 or 200 amps) on the breaker lever. The breakers in the two rows are primarily for branch circuits. These include the 15-amp circuits that feed the regular lighting and outlet circuits and the 20-amp circuits that supply outlets in the kitchen, garage, and other areas, as well as some appliances. Large breakers that provide 30, 40, or 50 amps are double-pole breakers that have double-size levers. These supply 240-volt appliances, like electric ranges and dryers. A large breaker may also supply a feeder circuit that brings power to a small circuit breaker panel, called a subpanel, somewhere else in the house. Subpanels are often used to supply power to large additions or detached garages or workshops. Back to the panel interior; behind the dead front panel, the two rows of branch circuit breakers mount onto two hot bus bars, which get power through the main breaker. All of the "hot" wires in the circuits connect to the breakers, and the breakers connect to the hot bus bars. The breaker panel also has a neutral bus bar and usually a separate grounding bar. The neutral circuit wires connect to the neutral bus bar and the ground wires to the grounding bar. From the grounding bar, a heavy copper wire runs outside of the panel and down to the ground, where it connects to a long copper rod driven deep into the soil. If there is a problem on any grounded circuit or in the panel, electricity can flow along the ground wires and safely into the earth via the ground rod. The standard circuit breaker panel capacity for a single-family home is 200 amps. Many older homes have 100-amp panels, and these can work just fine depending on your needs. 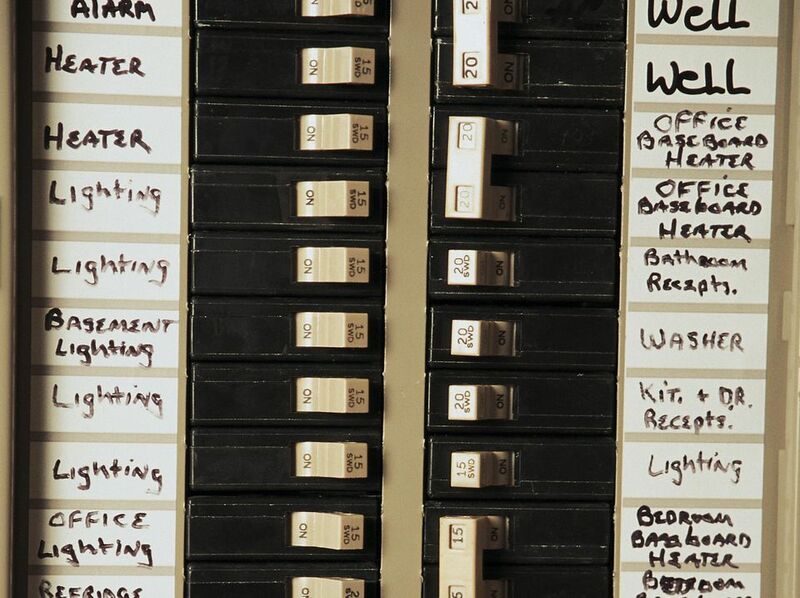 Very old systems may have 60-amp panels; these usually have fuses instead of breakers. They're safe if they're properly designed and maintained, but if you have any trouble with one, or if you need to add a circuit for more service, it's a good idea to upgrade right to a 200-amp panel. A larger panel itself won't use more electricity. It just means you'll have more space available for adding circuits and more electrical capacity to supply your household needs as they arise.